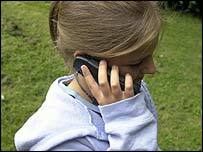 Using a mobile phone before going to bed could stop you getting a decent night's sleep, research suggests. The study, funded by mobile phone companies, suggests radiation from the handset can cause insomnia, headaches and confusion. It may also cut our amount of deep sleep - interfering with the body's ability to refresh itself. The study was carried out by Sweden's Karolinska Institute and Wayne State University in the US. Funded by the Mobile Manufacturers Forum, the scientists studied 35 men and 36 women aged between 18 and 45. Some were exposed to radiation equivalent to that received when using a mobile phone, others were placed in the same conditions, but given only "sham" exposure. Those exposed to radiation took longer to enter the first of the deeper stages of sleep, and spent less time in the deepest one. The scientists concluded: "The study indicates that during laboratory exposure to 884 MHz wireless signals components of sleep believed to be important for recovery from daily wear and tear are adversely affected." Researcher Professor Bengt Arnetz said: "The study strongly suggests that mobile phone use is associated with specific changes in the areas of the brain responsible for activating and coordinating the stress system." Another theory is that radiation may disrupt production of the hormone melatonin, which controls the body's internal rhythms. About half the people in the study believed themselves to be "electrosensitive", reporting symptoms such as headaches and impaired cognitive function from mobile phone use. But they proved to be unable to tell if they had been exposed to the radiation in the test. Alasdair Philips is director of Powerwatch, which researches the effects of electromagnetic fields on health. He said: "The evidence is getting stronger that we should treat these things in a precautionary way. "This research suggests that if you need to make a phone call in the evening it is much better to use a land line, and don't have your mobile by your bedside table." Mike Dolan, executive director of the Mobile Operators Association, said the study was inconsistent with other research. He said: "It is really one small piece in a very large scientific jigsaw. It is a very small effect, one researcher likened it to less than the effect you would see from a cup of coffee." Last September a major six-year study by the UK Mobile Telecommunications and Health Research Programme (MTHRP) concluded that mobile phone use posed no short-term risk to the brain. However, the researchers said they could not rule out the possibility that long-term use may raise the risk of cancer. In the UK, mobile services operate within the frequency ranges 872 to 960 MHz, 1710 to 1875 MHz and 1920 to 2170 MHz.